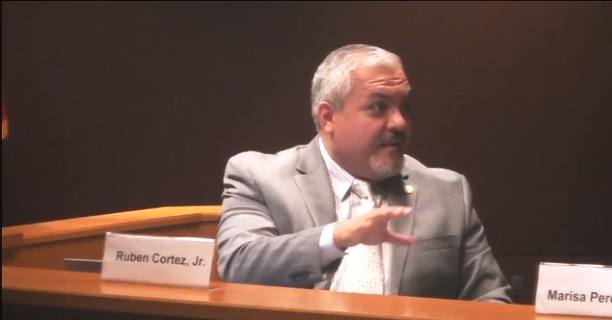 SBOE Member Ruben Cortez, Jr.
Texas AFT has been hard at work this week before the State Board of Education fighting for greater transparency in how prospective charter schools apply for state charters and how existing charter holders apply for new campuses. On Thursday, the committee heard from organizations representing administrators, school boards, and teacher organizations, including Texas AFT, who were in unison in their requests for substantially more transparency in the application process for new charters. The organizations offered several suggestions for how the process could be improved, including requiring hearings to gather public input, more detailed notices given to districts, and better assessments for how a new charter would impact neighboring school districts financially. Committee members overwhelmingly agreed with the call for more openness and input in the process, and today at the SBOE meeting of the whole, the School Initiatives Chair Barbara Cargill, told members, “We are all in agreement” about the need for more transparency. It’s uncertain how this agreement among members will translate into actual changes in the application process, but Commissioner of Education Mike Morath responded by saying he would be “contemplating the staff and resources necessary” for changes. Texas AFT also will be pursuing bills in the Legislative session that put steps to greater transparency into state law.